What is the challenge with big data? How did Stanby manage big data in the past? Why did we move to the Google Cloud Platform? Stefan Meier is Lead Engineer at Stanby - the search engine division at BizReach, Inc. Today, he explains why Stanby is moving from Amazon Web Services (AWS) to Google Cloud Platform (GCP) for data analysis. One of the most fundamental principles lies in the discrimination between streaming and batch processing. In batch processing, a set of events is collected over time and then processed later, whereas in the streaming model, data is processed in near real-time. Also, when dealing with streaming data new challenges appear, such as handling unordered data with unknown delays (see graph below). Indeed, the collected data events might originate from users with slow Internet connections, users accessing the site from multiple devices or there might be just network delays. Therefore, the gap between the time the event occurred (event time) and the time the event is observed by the system (processing time) ranges from a few milliseconds up to several hours. In order to combine and group related data, methods such as windowing are used. Removing the noise before processing the data (i.e. only process meaningful data). Breaking down the different problems (or steps) into small problems (and smaller sets of data) that are easier to process and need less computing resources (see also divide and conquer). Even if big data infrastructure becomes more and more performing, the problem should be broken down in order to decrease processing time and cost. One of the products that one might think of first is BigQuery - a serverless, highly scalable data warehouse. However, the Google ecosystem contains many other services related to big data. Most of them are fully managed services that integrate seamlessly with each other. Therefore, in most cases, there is no need to think about infrastructure management. Google Dataflow is one such fully managed service related to big data analysis. Its main features are auto-scaling and the unified programming model for streaming data and batch processing: The Apache Beam SDK. Compared to Hadoop for example, there is no need to address common aspects of running jobs on clusters (e.g. work balancing, scaling, etc.) since it is automatically managed. Also, the unified programming model abstracts the code from the runner and enables application engineers to focus on the logic without thinking about the infrastructure. This makes the code runnable on different runners, including Spark. Currently, Apache Beam supports Java, Scala, Python and Go. However, the latter two don’t cover the whole SDK yet (as of July 2018). As a service, Dataflow integrates with BigQuery, Pub/Sub, Cloud Storage and Cloud SQL, which makes it a core service. Business-related data, such as search quality, search engine usage, user behavior, SEO, and advertisement. Service-related data, such as infrastructure and application logs. Prior to moving to the Google Cloud Platform (GCP) for data processing, we relied solely on AWS infrastructure for processing and analyzing. In addition, we used Elasticsearch and Kibana for logging and service monitoring. In order to solve the problems mentioned, we started looking for alternative services and solutions. Since we mainly build programs with Scala, we were looking for a technology or a tool that is well used and that would not take too much time to learn and to adapt. We finally came up with a solution that fits our needs best: Use AWS in combination with GCP. The former is used for managing the existing infrastructure, the latter for processing big data. With the new workflow, we are able to use the strength of AWS and GCP. Indeed, GCP has many advantages regarding big data, especially the fact that application engineers don’t depend on infrastructure engineers and can focus on implementing new solutions. Also, the Apache Beam SDK makes it easy to combine streaming and batch processing. Nevertheless, AWS remains as the main service that we use for the infrastructure. Even if we are very happy with GCP, there are many features available in AWS which are currently not available in GCP (especially in terms of networking and security). 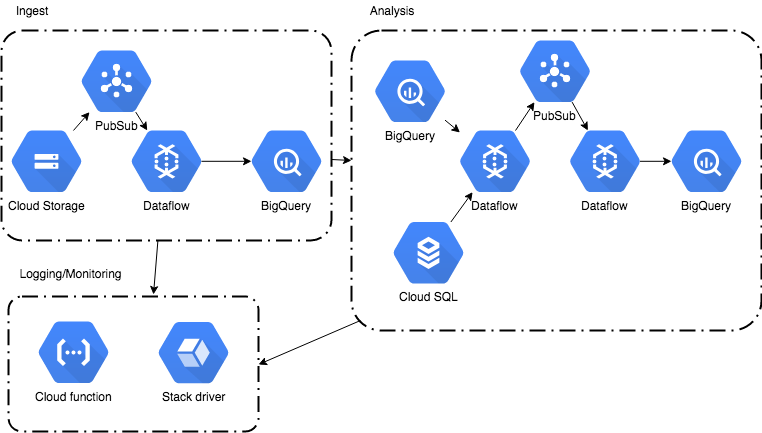 At Stanby, we will continue to actively develop data pipelines with Dataflow and move big data processing to the GCP ecosystem. We are for example working on moving our logging data pipeline from Elasticsearch/Kibana to BigQuery.